Obituary – Roesler, Gordon Eugene « Perry High School Alumni Association, Inc.
﻿F. F.A. 50-54; Wrestling 51-54. Funeral services for Gordon Eugene Roesler, age 72, of Perry, OK are scheduled for 2:00 p.m. Thursday, August 20th, 2009 at the First Christian Church with Martin Foster officiating. Interment will be in the Mt. Carmel Cemetery. Visitation will be from 9am-8pm on Wednesday, August 19, 2009 and family will greet friends from 6pm-8pm. Mr. Roesler was the son of Herb and Bertha (Foreman) Roesler and he was born on September 9, 1936 in Noble County, OK just north of Perry. As a youngster, Gordon attended Fairview and Four D Rural Schools from 1st through 8th grade. 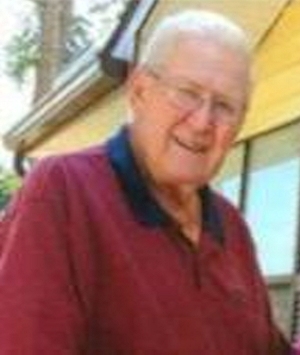 He attended Perry High School from 9th through 12th grade and graduated in 1954. Gordon’s friends gave him the nickname “Goose” and while in high school he began wrestling his senior year. Continuing Perry’s wrestling tradition, Goose won 1st in Regionals and at the Geary Tournament and finished 3rd at state. 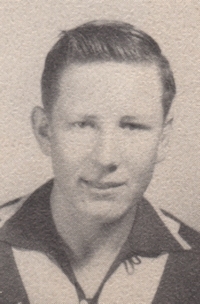 After completing high school, Gordon attended the University of Oklahoma where he wrestled heavy weight on the OU team from 1956 to 1958. During that time, his many wrestling accomplishments included taking NCAA 1st in 1956, NCAA 3rd in 1957 and NCAA 2nd in 1958. He won 2nd at the National AAU competition in San Francisco, California in 1958. In addition, he won the Big 7 in 1956 and 1957 and the Big 8 in 1958. In 1959, Gordon graduated from OU with a degree in Industrial Education. After College, Gordon returned home to Perry where he began working for Brent Oden for the next two years before returning to the farm his family owned. For the past 46 years, Gordon was very active in farming and running his own bulldozing service. He also enjoyed woodcarving, camping, fishing, reading, television and his animals. In 1974 at the age of 38 years, this long time bachelor married Nita Anderson Alexander. One of Gordon’s major accomplishments was immediately becoming a father to five wonderful children. After raising their children, Gordon and Nita continued to enjoy living north of Perry, near Black Bear Creek. Gordon passed from this life on August 17, 2009 at his home. Jon Alexander of Perry, OK; “Other Daughter”: Ronna Baird and husband Dr. Blake Baird of Perry, OK; 11 Grandchildren, 9 Great-Grandchildren, 1 Brother: Marvin Roesler of Grove, OK.
Memorials may be made to the Perry PAWS or Oklahoma Medical Research Foundation c/o Perry Funeral Home, 203 E. Fir, Perry, OK 73077.